Whenever new technoloy is introduced, people feel threatened. But with time, this new technology not only makes life easy and more enriched, it opens up new employment opportunities. Take movies for example. Initial movies were silent movies. They required technicians as well as actors. Movies began to speak from 1927, and in India talkies began in 1931. It suddenly opened up new opportunities. Actors who were ony needed to show their face till then, were now required to speak, and sing as well. Suddenly many good looking actors with poor voices found themselves unemploed. Movies began to speak, which meant they could speak in various languages and so different language movie industries came up. Language related artists, namely dialogue writers, and lyricists became essential for these movies. Since need of songs was felt so music directors and singers were needed. As one can see, the “simple” advancement in technology opened up new opportunities and that changed the face of movies. Personnel skilled in languages suddenyly found themselves in demand. Since Hindi movies came into existence in early 1930s, it followed that most artists of talkies were born in and around early 1900s. So, these early pioneers of Hindi movies were born some one hundred years ago. Many of such early pioneers have already completed their birth centenaries. This blog began on 19 july 2008. Some Hindi movie stalwards who have completed their centuries after than date are Leela Chitnis, K N Singh, K Amarnath, Gope, Kidar Sharma, Jagmohan Sursagar, Gopal Singh Nepali, Khursheed Bano, Bhagwan Dada, Jaan Nisaar Akhtar, Anil Biswas, Lalita Pawar, G P Sippy, Zohrabai Ambalewali, S D Batish, Kishore Sahu, Hansraj Bahl, Bharat Vyas, Shakeel Badayuni, Chitragupta, Kamal Amrohi, Qamar Jalalabadi, Roshan, C Ramchandra etc. Lots of artists will have their centenaries in the coming years. The year 2019 has just begun. Birth centenaries of several artists will fall this year. Today is 14 january 2019. It is the birth centenary of Kaifi Azmi (14 january 1919- 10 may 2002), who was born on this day exactly one hundred years ago. He was born in Azamgarh in Eastern UP which happens to be about 180 km away from the place where I am based at present. Coming to Kaifi Azmi, he was born as Sayyad Akhtar Hussain Rizvi. Like many other persons of literature, he was influenced by communism and Marxism and his literature reflected that. He became a CPI member in 1943 and a member of Progressive Writers movement in 1945. He was one of the first shaayars to join Hindi movies as a lyricist. His first movie as a lyricist was “Buzdil”(1951) where S D Burman was the music director. He penned three songs in the movie. All these three songs are already covered in the blog. According to my calculation, Kaifi Azmi penned some 360 songs in 93 movies. His last movie was “Ek Alag Mausam”(2003) whose songs were released after he had already left for the heavenly abode. Here is the filmography of Kaifi Azmi. As can be seen from the filmography, Kaifi azmi has penned many memorable songs that need no introduction. For instance, who can forget the songs of “Kaaghaz Ke Phool”(1959), “Haqeeqat”(1964), or the songs of “Kohra”(1964) and “Anupama”(1966). In “Heer Ranjha”(1970), he not only penned the lyrics but also the dialogues, the dialogues being entirely in verse ! One can look at his filmography and recall the songs from those movies. On the occasion of his birth centenary, here is a song from “Bahu Beti”(1952). This movie was directed by C L Dheer for Badoda Theatre Limited Bombay. This “social” movie had Geeta Bali, Amarnath, Jaswant, Vijaylaxmi, Rashid, Leela Mishra, S Nazeer, Nazirabai etc in it. This movie had seven songs in it. Six songs were penned by Kaifi azmi and one by Vishwamita Adil. One song from the movie has been covered in the past. The first song from the movie was deleted from the movie because of objections of censors. Those were the days when censors could often by quite sensitive towards matters that are taken in their stride today. The lyrics of the song were considered objectionable by the censors. Just imagine, a song penned by Kaifi Azmi was deleted from the movie because its lyrics were found objectionable ! The song luckily continued to remain in the records. Just as fortuitously, this song happens to be 200th song of Kaifi Azmi appearing in the blog. Here is this special song from Kaifi Azmi, on the occasion of his birth centenary. This song is sung by Geeta Dutt. Music is composed by S D Batish. Since the video of the song is not available, one can only gess about the picturisation. Seeing that Geeta Dutt’s voice appears in six out of seven songs, one can assume that she had sung for Geeta Bali, the lead actress of the movie. By that assumption, it would seem that this song was picturised on Geeta Bali. Nevertheless, I request our knowledgeable readers to throw light on the picturisation of this song. This article is written by nahm, a fellow enthusiast of Hindi movie music and a contributor to this blog.This article is meant to be posted in atulsongaday.me. If this article appears in sites like lyricstrans.com and ibollywoodsongs.com etc then it is piracy of the copyright content of atulsongaday.me and is a punishable offence under the existing laws. And thus he sang in 1949, with no conception that his voice and words are going to resonate around the globe into the 21st century or the next millennia. If he had known how famous and well known one day he was destined to be, I wonder how much more conscious and eager to reach the heights a performer of his class would have been. Or if he could have excelled himself in what way. As it is, he was in a class of his own. The thing about this whole saga called Mohammed Rafi ‘s songs, is that there is/was simply no competition. Here was me, literally stumbling in front of the street where he lived the last part of his life. It happened this saturday, I was visiting a fashion house on Turner Road, Bandra(W), and right there on the intersection there was this blue coloured sign board indicating the direction of Mohammed Rafi Marg. Normally western suburbs are not my choice of places to visit. Having lived all my life in Mumbai, I have also had my fair share of queries like ” Have you seen Shah Rukh Khan’s house ?” or some such things mainly from those who have never visited Mumbai. Long ago some Bollywood savvy driver had driven us around the Bandra area showing us the Bunglows and houses of Dilip Kumar, Meena Kumari etc. with some visiting relatives while we all were on a sight seeing trip. This time I was with my sister, mother and cousins doing some sort of research in current trends and fashions. Others call this same activity as window shopping 🙂 . I was gobsmacked to unexpectedly find that I can see Rafi Mansion. I told the elderly chacha from who driving the car, who is actually a Kishore and Rajesh Khanna fan, to just go and see if he can find Rafi Sahab’s home in the street, by the time we could finish the job in hand. Afterwards I asked chacha if he found the house. He replied that he couldnt find it. Having seen the road sign I was not about to give up. I said “Chalo dekhte hain kasie nahin milta” . I knew this has to be a small street and Rafi Mansion shouldnt be so difficult to find. 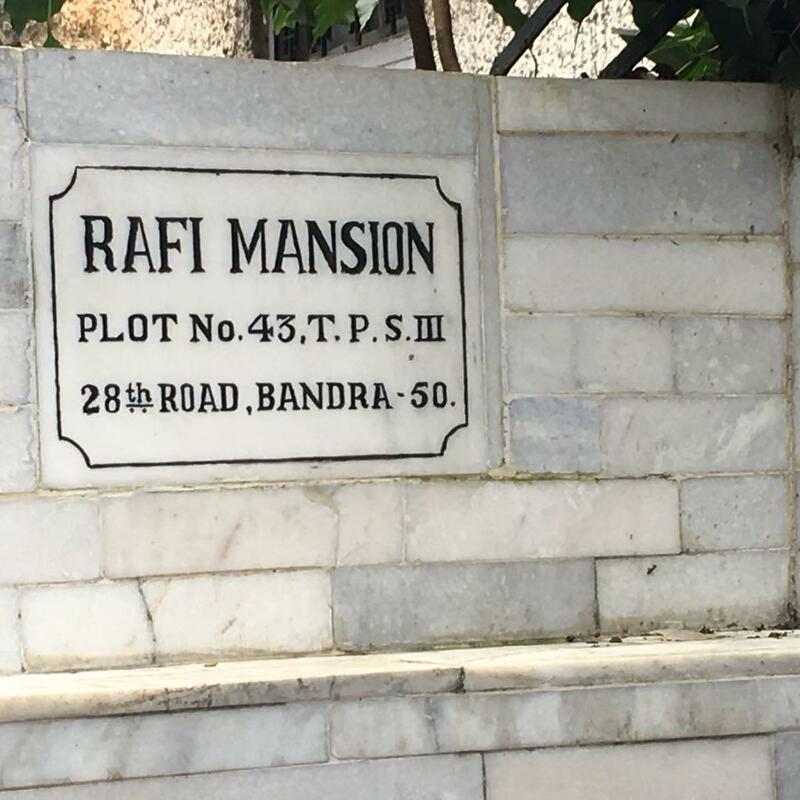 And Lo and Behold, there it was the gate marked “Rafi Mansion” on one side and “Bait-ur-Rafi” on the other side. The whole area, I realised must have changed over the decades. 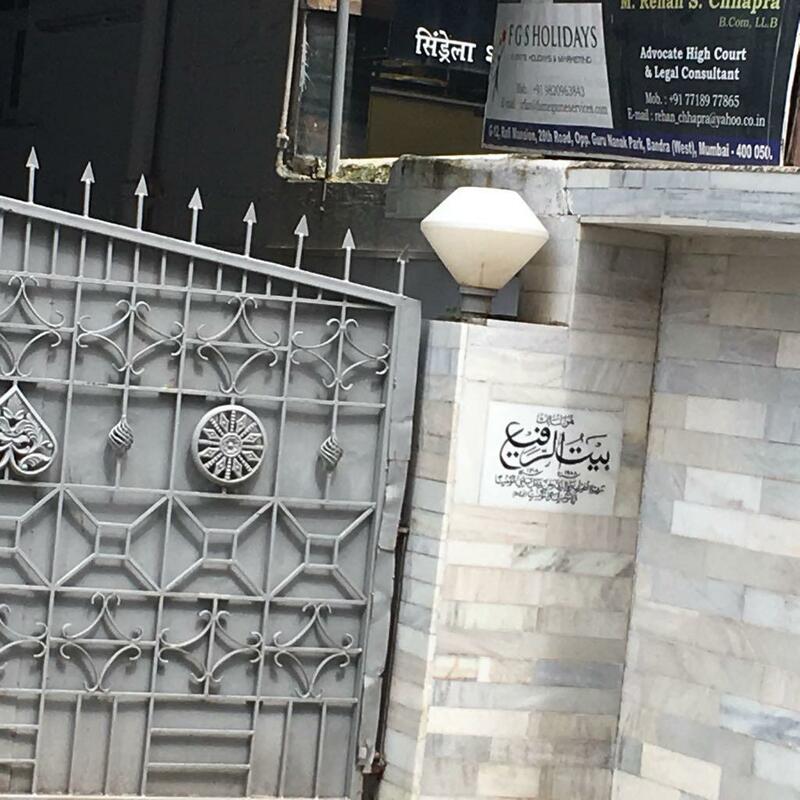 Of course the house that Rafi Sahab lived is no longer there and in its place is a building containing flats. A passerby told us, that Rafi Sahab’s daughter stays in the building but currently she is abroad. Fortunately, I wasnt too overwhelmed and remembered that I can take photos of the place as a memory of the moment. 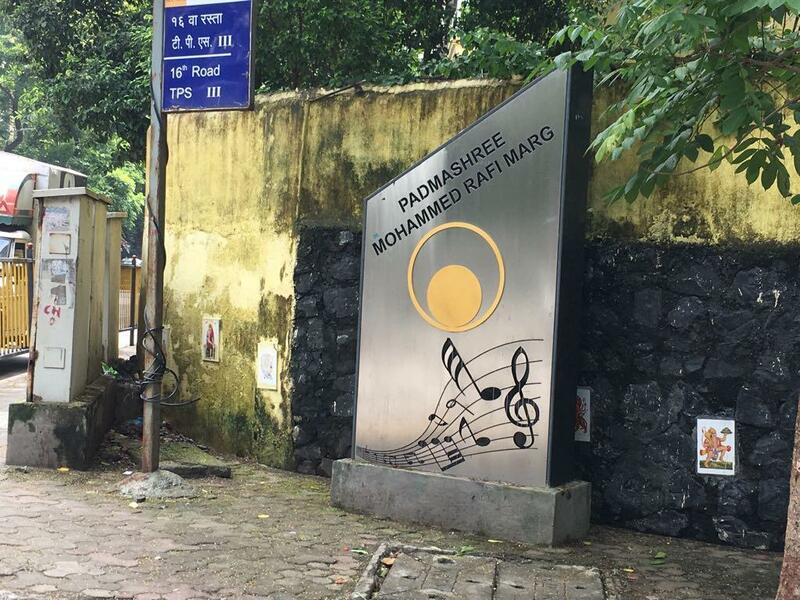 I did take the photos of the gate and the Memorial Plaque marking the street “Padmashree Mohammed Rafi Marg”. I have photographs to prove it, that I did visit the place and not making this story up just to write something in this post 🙂 🙂 . Photos are attached to accompany the post. Someone sure is taking care of both the plaque’s (On both corners of the road) and the gate with its silver paint and glaze. As we came away from there, we all were discussing inane things. I could’nt even ponder over what all info I have imbibed in all these years about Rafi Sahab’s house. I only realised today that, this was a momentous occassion and could be recorded here on this blog honouring the great nourishing and enriching value addition i.e. Rafi Sahab’s legacy, is to Hindi film music. The moment here is the 38th death anniversary, to be commemorated. A beautiful solo song that I found on youtube some months ago, with two versions, is worthy of the event. Its so touchingly rendered in the typical Rafi tones of the 40’s, that I longed to do this post. When I saw a post of a song from Shohrat (1949) a while back, I thought this song also will be posted soon. But than luckily it has been left alone, may be due to the fact that it deos not appear in the Geet Kosh. Whether this song was recorded for the film “Shohrat”(1949) or otherwise, the fact remains that this is a authentic Rafi rendition. Both the versions have the word”Tanvir” featuring in a sher, as a poets takhallus maybe. As per the information given with the link on youtube, it is from Shohrat(1949) composed by Aziz Hindi. The poet, as per the uploader is Tanvir Naqvi. On our blog we have a ‘category’ of ‘songs excluded from movie’, and so far, seventy-nine songs have been posted/included in this category of songs. Today I present a song from the movie ‘Kaalaa Pathhar’ (1979), which belongs to this category. I vaguely remember to have watched this movie in theatre when I must be 11/12 years old. Thereafter just six-seven years back I got its DVD from an online store to enjoy the movie again and revive the nostalgia. But, I was aware of the today’s song many years before, or exactly since 1991 when I got recorded this movie’s songs from the LP record, for my choice compilation of ‘Daag-Deewaar-Kaalaa Pathhar’ songs in a 90 min cassette. ‘Kaalaa Patthar’ was directed by Yash Chopra for his home productions Yashraj Films, Bombay. This movie was passed by Censor Board on 09.08.1979. Its cast holds a ‘galaxy of stars’ which includes Shashi Kapoor, Rakhi Gulzar, Amitabh Bachchan, Shatrughan Sinha, Neetu Singh, Parveen Babi, Prem Chopra, Parikshit Sahni, Romesh Sharma and Poonam Dhillon (in special appearance), Manmohan Krishna, Madan Puri, Iftekhar, Satyen Kappu, Yunus Parvez, Geeta Siddharth, Gautam Sarin, Sharat Saxena, Mac Mohan, Sudesh Mahaan, Sudhir Dalvi, Sudha Chopra, Harish, Mohan Sheri, Vikas Anand, Jagdish Raj, Suresh Oberoi, Prem Sagar, Pardesi, Nazeer Kashmiri, Ashok Razdan and many others. This movie has six songs, penned by Sahir Ludhianvi and composed by Rajesh Roshan. Interesting to note that the background music for this movie is by Salil Chaudhary. Kishore Kumar, Lata Mangeshkar, Mahendra Kapoor, Mohd Rafi, Pamela Chopra, S.K. Mahan, and Usha Mangeshkar have given their voices to the songs in this movie. Today’s song is written by Sahir Ludhianvi and thus this is the third song of Sahir Ludhianvi which I am able to share here under the category of ‘songs excluded from movie’, the earlier two being, Kya Tum Wahi Ho – from ‘Mann Ki Aankhen’ (1970) and Ja Ri Behna Jaa Tu Apne Ghar Ja from ‘Trishul’ (1978). The other Sahir songs which were excluded from movies, and which have been posted on the blog so far are also listed here – Rut Phire Par Din Hamaare – from ‘Pyaasa’ (1957), Yoon Hi Dil Ne Chaaha Tha Rona Rulaanaa – from ‘Dil Hi To Hai’ (1963) and Saajan Bin Neend Naa Aawe – from ‘Munimji’ (1955). HFGK Vol- V doesn’t mention anything about ‘exclusion’ of this song from the movie. I would request knowledgeable readers to share information if any they have about this song please. Mujhe pyaar ka tohfa de ke. . .
“Kahin Pyaar Na Ho Jaaye”(1963) was directed by K Parwez for Young Technicians Unit-Baria Films, Bombay. The movie had Shakila, Mehmood, Om Prakash, Johny Walker, Sheila Kashmiri, Poornima, Shammi, Anwar Hussain, Amar, Altaf, Dilip Dutt, Brahm, Jeewan Kala, Madhumati, Kallan, Babu Raje etc in it. The movie had six songs in it. Four songs from the movie have been covered in the past. Here is the fifth song from “Kahin Pyaar Na Ho Jaaye”(1963) to appear in the blog. This song is sung by Rafi. Anand Bakshi is the lyricist. Music is composed by Kalyanji Anandji. Only the audio of this song seems to be is available. I watched the full movie available online but I was unable to locate the song in that. So it could mean that either this song was excluded from the movie, or the song has been removed from the print available online. I request our knowledgeable readers to throw light on the picturisation of this song. As of now, I assume that this song was excluded from the movie. “Mehbooba”(1976) was based on a novel by Gulshan Nanda. It was produced by Musheer-Riaz and directed by Shakti Samanta. The movie had Rajesh Khanna, Hema Malini, Yogita Bali, Manmohan Krishan, Nazir Hussain, Sujit Kumar, Asrani, Asha Sachdev, Prem Chopra, Meena.T., Harindranath Chattopadhyaya, Chandrashekhar, Leela Mishra, Madan Puri, Master Alankar, Birbal, UmaDutt, Raj Rani, Abhimanyu Sharma, Ram Murti Chaturvedi etc in it. The movie had eight songs in it. Six of the songs have been covered in the past. Here is the seventh song from “Mehbooba”(1976) to appear in the blog. This song is sung by Lata. Anand Bakshi is the lyricist. music is composed by R D Burman. It is a superb semi classical composition from a music director who was popularly known as one using western tunes and instruments in most of his compositions. Curiously enough, such a wonderful composition based on Raag Bihaag could not find place in the movie. This song was not included in the movie. The record of the song thankfully were released and became quite popular. “Amaanush”(1975) was produced and directed by Shakti Samanta for Shakti Films, Bombay. The movie, based on a Bangla story by Shaktipada Rajguru, was made in Hindi as well as Bangla with the same actors. The movie had Uttam Kumar, Sharmila Tagore, Anil Chatterjee, Prema Narayan, Utpal Dutt, Abhi Bhattacharya, Manmohan, Asit Sen, Manik Dutt, Tarun Ghosh, Amol Sen, Subrotho Mahapatra, S N Bannerjee, Rajni Gupta, Probir Roy etc in it. Kishore Kumar and Asha Bhonsle, the two main playback singers of the movie were nominated for filmfare awards for best singers. Kishore Kumar went on to win the best male playback singer award for the song “dil aisa kisi ne mera toda”. Here is the fifth song from “Amaanush”(1975) to appear in the blog. The song is sung by Kishore Kumar and Asha Bhonsle. Indeewar is the lyricist. Music is composed by Shyamal Mitra. This song was excluded from the Hindi version of the movie and only its record version is available. However, the Bangla version of this song, sung by the same singers, was picturised in the Bangla version of “Amaanush” on Uttam Kumar and Sharmila Tagore as Jodi hoye chor kaanta. One person has superimposed the Hindi song on the picturisation of the Bangla version of this song and has uploaded it on YT, passing it off as the “rare” clip of this song of “Amaanush”(1975) Hindi version. Here is this lovely romantic duet from “Amaanush”(1975), which was excluded from the Hindi version but whose Bangla version was retained in the Bangla movie. “Chor Baazaar”(1954) was produced and directed by P N Arora for All India Pictures, Bombay. The movie had Sumitra Devi, Shammi Kapoor, Chitra, Kammo, Amar, Wazir Mohammad Khan, Shameem, Ram Avtar, Cuckoo, S M Abbas, Parasram, Munshi Munaqqa, Jagdish Kanwal, Sheetal, Om Prakash etc with Wasti, Randhir and Shashikala as guest artists. We all know the meaning of the word “Bhaand”; for those not conversant with colloquial Hindi; googling the word throws up meanings —Clown, Mimic, Comedian etc. “Bhaands” are also traditionally folk entertainers which might mean a storyteller, minstrels, dancers, actors, impressionists etc. Most bhaands belong to families that are engaged in folk entertainment as their hereditary profession, their specific art forms vary greatly by region, community and language. The term bhaand itself can also mean either a specific dramatic story or an entire form/school of drama. So we are on our next movie which has one song left. This is the 1964 release “Door Gagan Ki Chaon Mein”. It was written, produced and directed by Kishore Kumar. The movie also had Kishore Kumar as music director.